As the days are now getting shorter, and those cool evenings start creeping in, I always start to get a bit reflective. Perhaps that's because I sense the coming of a new year, or maybe just because my birthday is in late November. Nothing slaps you in the face with your own mortality quite like bumping up your age by +1. It is funny how you can be 41 years and 362 days old, and still think of yourself as 41. As soon as that odometer rolls over though, reality sets in. It seems like only yesterday that I wrote about how I was turning 40, and soon now I'll already be 42. Time....such a silly thing. There are a lot of wheels spinning, gears turning, and adventures planned for me on the horizon...but I do still think it's necessary to find time to ease down a bit on occasion. Every year, I usually bring my running to a stop, and begin a Winter hiatus of sorts. I like to see this time as a break for my body to heal a bit and recover from the year. Usually there's a lot of travel around the Holidays too, so it all sort of works out as a good time for a slow-down. Following two very hard outings at both Hardrock and Spartathlon, I've definitely brought my running volume down significantly. I made an appearance up at the TARC Ghost Train, but opted for just the 60-mile version. 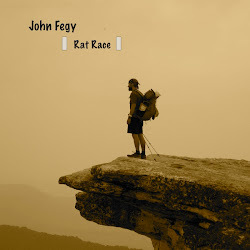 Coming up in a few weeks I'll run the 6-hr TARC-Key trot again, and then finish the year out with the TARC Fells 50k. I treat each of these events as a "fun day out", and never push too hard. In some ways, I see them as my bonus, or victory laps. After a full year of racing, it's nice to just "play in the woods". The last few years I also brought to a close with what has become an annual tradition for me...and something I greatly look forward to: The Mountain Masochist Weekend. Let me back up for a minute to give some context. In 2012 when I rolled into Frozen Head Park for my very first attempt at the Barkley Marathons, the first person I met, was Travis Wildeboer. We connected immediately and within minutes he was sharing incredibly useful tips about the course and "tricky spots" to be aware of. I have been forever grateful for some of the tips that Travis gave me in those few days leading up to the race, as they ultimately helped aid me in my eventual 5-loop finish. In addition, during the race itself, Travis's wife Alyssa took it upon herself to act as my de facto crew and fed me heartily during ever inter-loopal transition. I would have definitely not eaten enough calories, or at least as many good calories, had she not done this. Later that year in August, I saw Travis and Alyssa at Leadville, during the race. I ran a bit with Alyssa in the early miles and ended up finishing just a few minutes behind her. Travis was pacing for her from the turnaround, so I saw them both near Winfield as I was coming in and they were going out. 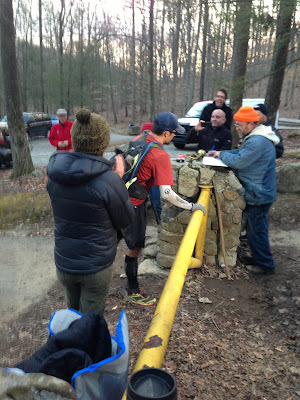 One year later, I ran into trouble during my second Barkley attempt and was forced to drop late in loop 2. Travis pushed on...and several hours later I found myself now in a reverse role. I was assisting him as his crew from the sidelines. I hiked up to the Fire Tower on later loops to cheer for him, and helped with the crewing back at camp. It felt like somehow I was "paying it back". After his finish, we traded stories and that's when he invited me to come run the Mountain Masochist with him. Travis told me a story about how when he was just 20 years old back in 1999 (the year he thru-hiked the AT), he met this crazy endurance athlete named Andrew Thompson. They became friends and Andrew invited Travis to run this "insane" 50-mile race in Virginia that was put on by none other than David Horton: The Mountain Masochist 50 (MMTR). Andrew had run it himself the previous two years. In November of that year, Travis ran the MMTR alongside Andrew and one of his other friends, Jonathan Basham. They had such a good time, that they all ran it together again the next year. ....and the next year... etc. Eventually, it became a yearly tradition. While at first the annual meeting was about the run itself, it soon became more about the fun weekend hanging out, with the run being the "excuse" to all get together. In 2013, when Travis asked me to come join for the MMTR, I was hesitant. By that time, the three of them were all Barkley Finishers, and despite my eeked-out finish in 2012, I just wasn't sure I'd earned the right to run with these guys. Ultimately, I chose not to go that November for various reasons, mostly related to my grad school work piling up. Looking back, I realize now that this was a mistake, and that I should have made time for it. Fast forward one year to late 2014. Again, Travis asked me to join....and this time, having just defended my dissertation, with a lot of stress off my plate, I accepted. I was nervous about spending a weekend with all of these guys. Andrew, Travis, and Jonathan (JB), all have long-distance trail FKT's to go with their Barkley finishes. 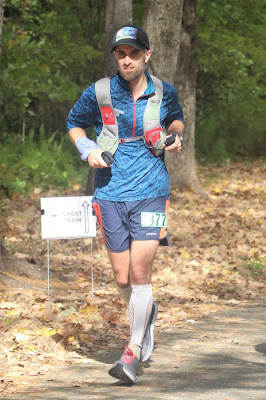 Somehow, despite my squeaker of a finish at Barkley, I still couldn't help but feel I didn't belong. What I came to find out that first year though was that none of that matters. Everyone that shows up for "MMTR Weekend" is there to just tell fun stories, laugh, go for a fun run in the woods, and relax. No one is measuring accomplishments, or boasting, or comparing.....quite simply, none of the people at MMTR weekend are like this...and frankly, I should have known that. There isn't an ounce of negativity or condescension in any of these guys. They are all welcoming and my nervousness about "fitting in" faded quite quickly. At the start of the run itself, they all inform me that there was a time when any one of them might run a "fast" race, but these days, the goal is to finish in 12 hours and enjoy the ride. Perfect. So that year, I timidly joined the group and ran my first MMTR. I listened as they all retold stories from their 8th Masochist....or their 14th Masochist. It was hard for me to wrap my head around a 37-year old, running a race for their 16th time. The most I've ever repeated an event was my 5 finishes at the Finger Lakes Fifties. I can't fathom running an event almost 20 times. We rolled along the course, and 11 and a half hours later, crossed the finish still laughing. It was a blast. What followed was another 2 days of weekend relaxing, camping, and telling more stories. Before I knew it, November 2015 was approaching, and without hesitation I signed up again. And again, it would be another fun-filled, and story-filled, weekend. As a veteran of the course, I also wasn't nervous at all about cut-offs, or when/where the big hills would be. In 2016, I was excited to return for my 3rd MMTR weekend, but had to deploy to Antarctica that very weekend. I was honestly quite sad about it and told the group that I would missing the run that year. As I was en route to New Zealand for my deployment, I realized just how much I was missing the weekend, and trading fun stories with the gang. Last year, I was able to return, for what would be Andrew's 20th finish. Here I was at a measly 3, and Andrew (who is the same age as me), was out there running his 1000'th mile on the 50-mile course. What's more, is that Travis was on 19, and JB on 18. Simply ridiculous. At the end of the race, Andrew was awarded a jacket, with a custom-ebroidered 20-year finisher patch. I'll admit, it was pretty damn sweet. Fast forward to today. This year's run has now just come and gone, and it was another fun-filled weekend. It's hard to believe in just this short time, I've already amassed 4 finishes now myself. I am starting to understand how it's possible to get up to 20. Every year we run, there's always a different collection of stories we trade on the trails. Travis has made a habit of writing down topics on the back of his bib number, so in future years we can go back and remember what we talked about during the runs. It's always a fun time. This year was a bit more quiet than usual however....Andrew was not able to come, and it definitely felt a bit off during the run. We all did celebrate though as Travis crossed the finish for what was his 20th finish, and I thought to myself that next year would already by my 5th. Next year will also be JB's 20th. Over these past 4 years, the MMTR run and weekend has become something that I genuinely look forward to. I have come to think of everyone involved now as my friends, and that fleeting weekend as a highlight of my year. I genuinely hope that I am able to do this for as many years as my body allows...and even if I can't run, I'll still try to visit and join the group for the festivities. As I get older I find that while I still do enjoy to push myself during an event, and maybe go for a fast time or PB, I am also very happy to just relish in the camaraderie and friendship of those around me. The MMTR weekend perfectly encapsulates this. What makes it all so special is that I believe that this realization is shared amongst everyone. MMTR weekend is about the people and the stories. The run itself is really just a venue. It's that local bar, with cheap beer, that we all meet up at to trade stories and laugh about ridiculous nonsense. So thank you Travis, Andrew, JB, and the familes and friends of MMTR weekend. Thank you for inviting me in to join the "family". I look forward to 2019 and can't wait for the entertaining and absurd stories that unfold while we watch JB get his 20th finish. Crossing the finish line for Travis's 20th finish!